Marlie and Me: Monday Morning Parenting: What is Your Baby Food IQ?! Monday Morning Parenting: What is Your Baby Food IQ?! We decided long before Marlie was born to make her baby food when she was ready for solids. This decision was made for both economical and health reasons. It truly is less expensive to make than to buy baby food, but most importantly it is so much better for babies to eat natural foods that are fresh and whole in nutrients. 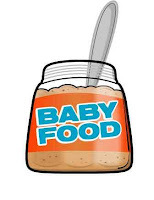 Still, I never knew how superior in quality our homemade food was to store-bought until Damon came across this report Cheating Babies: Nutritional Quality and Cost of Commercial Baby Food. I encourage you to read it. I am outraged that there are commercial baby food brands marketing what is essentially fillers and water as wholesome, nutritious "food." As consumers, we are so brainwashed by slick advertising slogans and images that we don't question what is really in those jars plastered with pictures of cute, chubby babies. Why would we though? We TRUST these brands! Meanwhile, we shell out top dollar because we believe that we are providing a quality product that will help our little one grow and thrive. Only the best for our babies, right?! The food industry has really gotten out of hand (the real problem is that it is controlled by a handful of multi-national companies, but that is another post. Go watch Food Inc. and then we'll talk). Parents, we have to wake up! Think of processed baby food as a gateway drug. The sugars and salts used in the majority of commercial baby food brands train our kids to crave more sugary and salty foods and sets them up for to a host of childhood health issues such as obesity and diabetes. That's how drug dealers get addicts hooked! I think the return on investment is worth it...healthy, happy kids! I so totally agree with making baby food at home.. I did that for my daughter and not only was it easy once I started planning her meals, I was absolutely sure of the quality that she was getting. Great post and a must-share idea. I have also found that in making my own baby food I find myself challenging my own eating habits and what I am putting in my body. I want my baby to be able to eat what I eat so I constantly have to think, would I feed this to Lila? Great post!!! I so needed to see this today! I had intentions of making my own baby food but have really slacked off. We still aren't doing solids all that regularly but I really need to get back on track with this. For the sake of convenience, I've been using the commercial stuff when I do find the time to do solids. Great Article! I planned on making Orlaith's baby food, but this totally helps to support my decision! Is there a book or blog you recommend when it's time for solids? We're going to wait as long as we can, but I will definitely be making her food and foregoing the baby food jars full of high fructose corn syrup! Thanks for your help as always!